I still haven't gotten back to normal post the cross country move and Disney trip. However, I think I finally found "it." 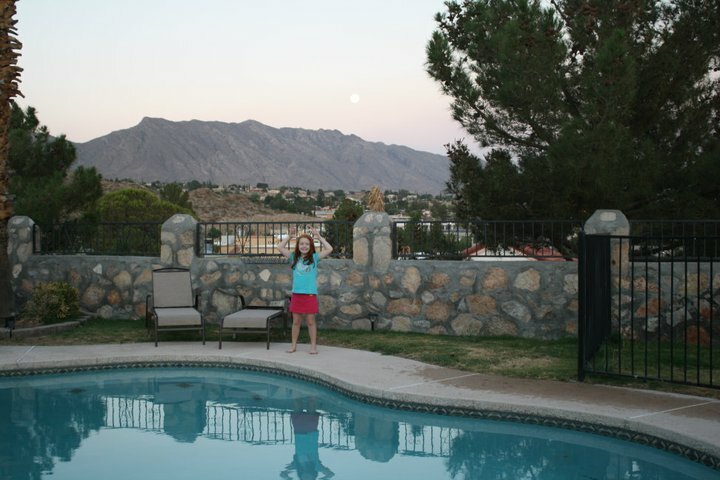 For a week now, I've been using this gorgeous new pool of ours that looks over the Franklin Mountains to exercise. I was just kicking back and forth because I didn't realize I could actually swim. I took swimming in high school but haven't really swam since. Yesterday, low and behold, I realized that I can actually swim and tread water so I started doing laps. Not many because wow, does that make you tired! I have my oldest with me who wanted to spend time before she returned to Georgia and so I made her do everything I was doing. I found some really good exercises for the pool so I just did a circuit type workout of moving on to a new one. It worked because I actually had to get up around midnight to take an ibuprofen for the aching. The big deal was this morning when I woke up and weighed myself and found that I have only gained back one pound from the 19 pounds I have initially lost since April. I'm amazed that I have kept it off and I have to credit my loss to the Dukan Diet which is what I went on to lose that weight. Granted I know the diet isn't healthy but being overweight isn't either so for the short term, I felt it was okay. Now, I'm just cutting calories and reaching for watermelon over Hershey bars (well, mostly). What accomplishment have you done recently that brings a smile to your face? This is easy as it's my weight loss. My entire psyche is based on how I feel and when I'm overweight, it really affects so much inside me. I have always been caught in that vicious cycle of eating too much, feeling bad, eating more to feel better for the moment and then on and on. I have found that when I'm unhappy, mostly in a relationship, I tend to get overweight. They always joke that a woman always looks better after a divorce and now I finally get it. So many of us turn to food for comfort and haven't found the emotional change in ourselves to overcome it but boy, when you lose that weight, a smile and a while new confidence is released. It's definitely one of those mental games you need to play when trying to lose weight which is to remember how good it felt when you lost those "bad relationship, bad times" pounds. Remembering that feeling or projecting how you look when you are at the weight you want to be are all effective in getting back to shape. Ultimately, remembering that smile should do the trick. Moving can be so stressful. You are doing great and should certainly be proud of your weight loss. Thanks so much Lena & Jenn! :) Getting ready to do some laps in the pool now!